Breast Cancer is treatable if it’s detected early on. This means that if you, or you and your partner, examine your breasts regularly for warning signs, you stand a better chance of finding lumps before it’s too late. The soap you use in the shower allows your fingers to glide along the surface of the skin, making it easier to feel irregularities in the texture of the breast tissue. Checking your partner’s breasts – or your own – isn’t all about intimate fondling; you have to stay focused. Gently massage with varying levels of force to ensure that the area is thoroughly examined. Remember that it’s not just the soft breast tissue that needs to be checked, but the whole chestal area – from collar bone to armpit to upper ribcage. It doesn’t matter whether your cup is half full or if it runneth over – it’s essential to take a hands-on approach to your boobal well-being. Use these three easy steps when examining your breasts and consult your doctor for further information. See more at R.O.I Media. BTW, today is my one year blogaversary. Woo hoo! A year ago I wrote my first post: You’re doing WHAT? What a difference a year makes!!! 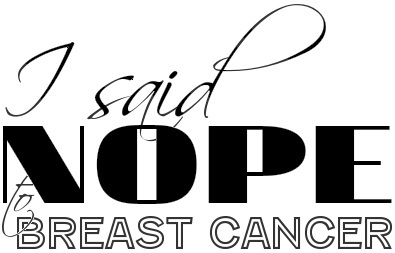 This entry was posted in All and tagged Awareness, bad idea, Boobies, breast cancer, Good idea, health, Pinktober, self-exam on October 27, 2013 by nope2BC.